1. Preheat the oven to 200˚C, gas mark 6. Put the potatoes in a large pan and cover with cold water. Add a pinch of salt, bring to the boil, then simmer for 15 minutes, until almost tender. Drain and refresh under cool water, then thickly slice (or halve if very small) and tip onto a large baking tray. Add the butter beans and asparagus, then toss gently with the oil, season and roast for 30 minutes. 2. Meanwhile, put the fromage frais and chopped watercress in a small food processor and whizz until finely chopped and pale green. Stir in the mayonnaise and season. 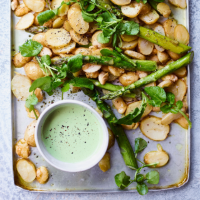 Serve the roasted vegetables with the extra watercress sprigs and dressing. This is great with poached eggs and/or smoked salmon for brunch. This recipe first appeared in Waitrose Food, April 2017 issue. Download the Waitose Food app for the full issue.